Our rooms are waiting for you. What are you waiting for? Himmel House rooms are named after former, notable owners of the house. The DeCuyper room is named after Dee and Madeline DeCuyper who purchased the house in 1989 and are credited for ‘saving’ the house by restoring it to its original beauty. The DeCuypers never resided in the house throughout the 13 years they owned it. Many weekends and holidays were spent in the house, but they resided full time at their home in Arma, Kansas. The spacious DeCuyper Room served as Dee and Madeline's room when they were in town. Our most reserved room at Himmel House, it features a king bed, private bath, electric fireplace and a rooftop balcony. It can be connected to the adjoining Blair Room if traveling with family or friends. The Blair Room is named after John and Rosalie (Lanyon) Blair who were given the house as their wedding gift from Rosalie’s parents in 1918. Nice wedding gift, right? The Blair name has been associated with the house longer than any other owners and is known by many as the Blair House. Books dating back to the 1930s and owned by Arthur Blair, son of John and Rosalie and grandson of Arthur Lanyon, can be found scattered throughout the guest floor. 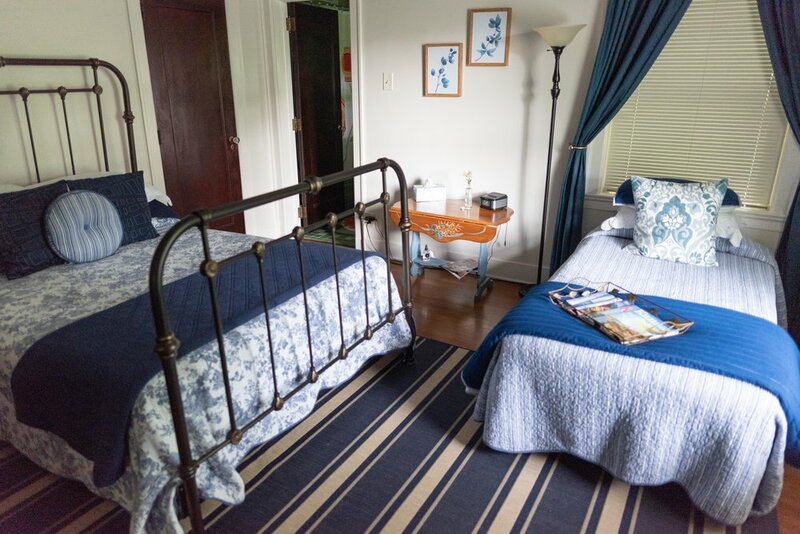 The Blair Room features a 1920s tile bathroom and is equipped with a queen and twin bed to better accommodate families or friends traveling together. It is adjacent to the Decuyper Room and can be opened to connect the two rooms. The Lanyon Room namesake is Arthur Lanyon, who built the house in 1905. The Lanyon family relocated to Pittsburg from Wisconsin to start a smelting business in the late 1800s due to the booming mining industry in the area. Rumor has it that Arthur Lanyon and Frank Playter, Pittsburg founding father, had a poker game to determine where their homes would be built. Playter won, choosing the lot directly to the south from Himmel House. We believe Lanyon Room guests are the real winners. This room offers a king bed, private bath located just outside the room and a cozy sunroom to curl up and enjoy a book or just gaze out at the brick courtyard. Host your small but mighty gathering at Himmel House. We do showers, receptions, meetings and more.